Security and privacy concerns have made some parents reflexively opposed to any collection of their children’s information, but in order to deliver personalized education, districts have to gather and share students’ statistics. 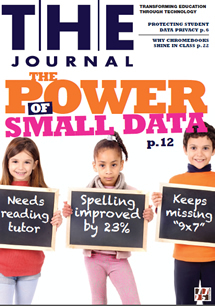 Here’s how the strategic use of data can boost teaching and learning. Our legal expert explains why districts (and vendors) would benefit from more robust protection of educational data. Is There a Moore’s Law of Network Capacity Growth? Digital transformations can tax networks to the breaking point. Here’s how to make sure your infrastructure is ready for the demands of new devices and digital curriculum. Internet-enabled school buses keep students connected on the road, in school parking lots and in their own neighborhoods. The latest WiFi specification promises speed and capacity advantages, but the performance it delivers will depend on your district’s devices and infrastructure. Here’s how creative educators are using hardware and software to build a bridge between the digital and physical worlds. Val Verde Unified School District uses mobile hardware and software to keep students and teachers on the same page.